It's official. The crowdfunded, officially sanctioned RoboCop statue has found a permanent home in Detroit. The Michigan Science Center will become the permanent location for the 10-foot-tall bronze statue after nearly a decade of looking for a proper place for the RoboCop monument. The official unveiling of the statue has yet to be announced, but it's expected to be revealed any day now. This is huge news for RoboCop fans who completely funded the Kickstarter back in 2011. The original goal was $50,000 and the campaign ended with a grand total of $67,000. Imagination Station announced that the RoboCop bronze statue had officially finally found a home on its Kickstarter update page earlier this week. The unveiling of the statue is expected to be this spring or summer, but as previously noted, no exact date has been announced at this time. Imagination Station also announced that pieces of the statue will be on display at the Michigan Science Center ahead of the unveiling. The announcement reads. "We just signed the paperwork with the Michigan Science Center today who will be showing off pieces of the statue at a private event later this week." The Michigan Science Center is holding its annual fund raising gala this weekend, kicking off today, May 4th, so RoboCop fans can head over and see the head and torso of the statue. However, tickets are reportedly sold out, though there are still some afterglow tickets still available. As far as completing the statue, it just has to be all welded together, which will happen on site at the Michigan Science Center right before the unveiling takes place. The Michigan Science Center president and Tonya Matthews stated that the center is, "honored to be the host site for this amazing piece of art." Matthews then noted how important the RoboCop statue could be for young people interested in checking out the statue and then seeing what else the Science Center has to offer. She then took time to correlate RoboCop with the power of the STEM projects. She had this to say. "At the Science Center, we aim to inspire curious minds of all ages with science, technology, engineering and math (STEM) and we think RoboCop will remind us of the power of STEM and the resurgence of Detroit." 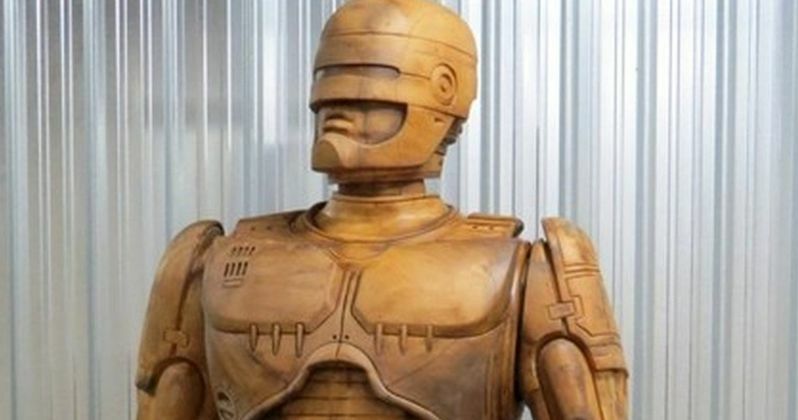 The MGM sanctioned statue of RoboCop has been a long journey for all involved, but the 10-foot-tall bronze statue honoring one of the greatest movies of the 1980s, as well as one of the best fictional police officers of Detroit, has finally found its home. The Imagination Station hopes that more people will come visit Detroit to see the statue and appreciate their city as much as they do. If the Kickstarter campaign is any indication, Detroit is about to get a ton of new visitors when the RoboCop is officially unveiled. You can read more about the RoboCop statue finally finding home over at KickStarter.